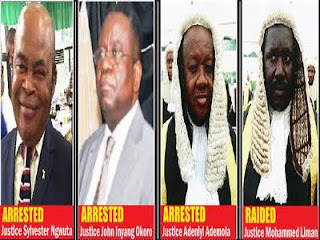 Agents of the Department of State Security DSS have arrested two more judges over allegations of corruption. According to The Nation, Justices Bashir Sukola and Ladan Manir of the Kaduna State High Court, were arrested in Kaduna and taken to the DSS Headquarters in Abuja at about 8.30pm yesterday October 12th. A source in the DSS says that accounts of some of the judges currently under investigation have been frozen.